This entry was posted on 2018-08-25, 07:44 and is filed under Machine Shop, Oddities. You can follow any responses to this entry through RSS 2.0. Both comments and pings are currently closed. 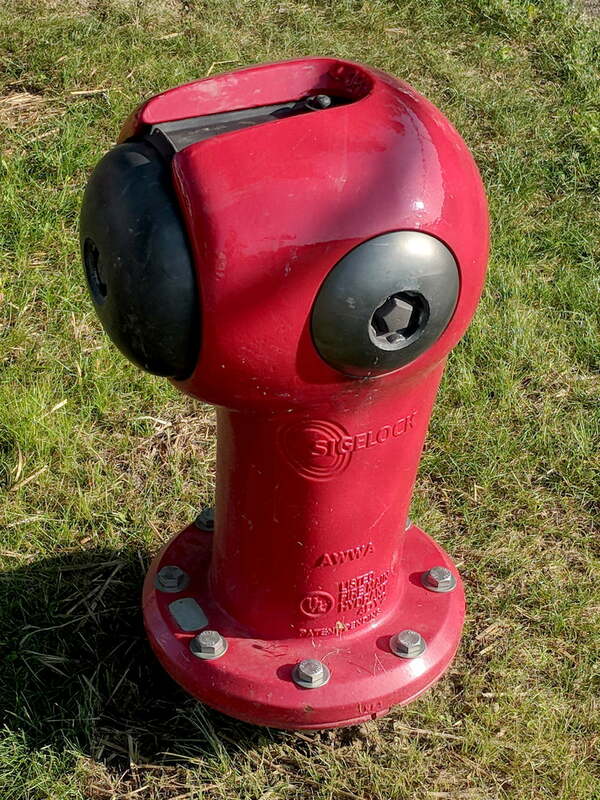 I took a lok at their site; the hydrant is better than you fear. [grin] The only fiddly bit is the sliding anti-tamper plate at the top. Internally, it’s somewhat more refined than bog standard hydrants. To get to the big (IIRC 6″) hose, undo the big cap and slide out the tamper plate. The same (special) wrench works on both. It’s different from the flattish wrench carries for standard hydrants, but it’s not bad. The smaller (4″) hose cap comes off with the same tool, though the big cap and tamper plate have to come off to get to the valve. Our rural department usually uses the 4 inch line. The big city near us uses Storz adapters which make it a bit less painful to hook up the big hose line. I had to read all about it, too, and marveled at the sliding, ratcheting, spring-loaded pins locking the side caps. Truly a solution to a problem I hope never happens to the hydrant at the end of our driveway! Which, come to think of it, got replaced when somebody drifted off the high side of the (shallow) curve and killed it stone cold dead. Didn’t wreck the valve at the bottom, though, so we didn’t have a geyser. We did move the “where you wait for the school bus” spot a dozen feet up the driveway, behind a large-ish tree, just on principle. The big question: will dogs find this new hydrant acceptable? I haven’t yet seen a dawg pretty enough for such a hydrant!